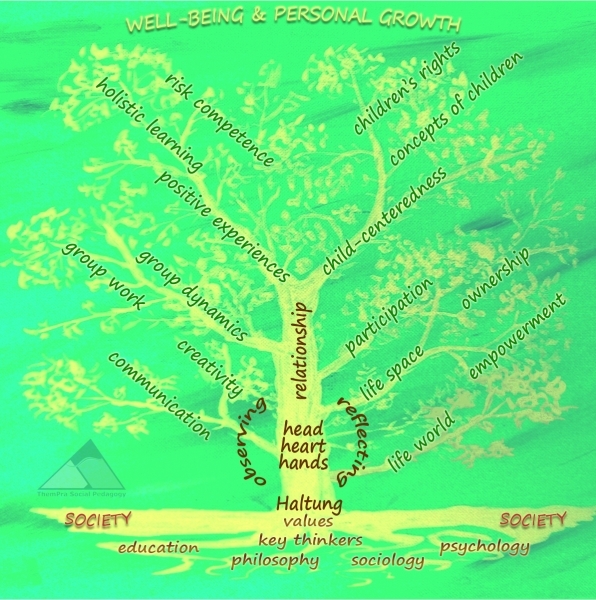 ThemPra’s Social Pedagogy Tree symbolizes that social pedagogy has organically grown out of societal conditions. It is solidly rooted in society, with the different roots representing different strands of particular influences on social pedagogy, such as theories from related disciplines or influential key thinkers that have shaped the development of social pedagogy. The trunk forms the core of what social pedagogy represents in theory and in practice: the holistic approach to education in the broadest sense, the centrality of relationships, and the use of observation and reflection as a tool for continuous development of all (systems and people) that are included in the pedagogic process. The branches outline various predominant elements that form part of social pedagogy, and each of them is underpinned in its significance by theory and research. This makes it helpful to apply theory to practice. For instance, the knowledge of communication models makes practitioners more self-reflective about and conscious of how they communicate. As with every tree, growth takes place in two opposite directions, both away from and further into the ground. This reflects how social pedagogy interacts between society and the individual. Social pedagogy aims to provide nurturing conditions that support children’s growth in both directions, towards independence and interdependence. In Goethe’s words ‘children need two things from their parents: roots and wings’. Similar to this is the growth of social pedagogy itself: through dialogue, social pedagogy takes influence on how society is constructed, and in reverse these constructions take influence on how social pedagogy is shaped. Because of this vital relationship with society, social pedagogy cannot simply be transplanted. It flourishes best when embedded into the culture and existing practice, and therefore it takes time and constant care to grow. If you would like to order posters or a set of postcards of the Social Pedagogy Tree, please click here.